Lexmark Dash is an annual 5Km fun run event exclusive to all employees of Lexmark Cebu, Philippines, and their dependents. The said event usually falls on the last quarter of the year, in time with Christmas holiday celebration. * One is that The T-shirt was especially designed to attract employees, not only those who have interest in running but also to the newbies or curious about running. I really like the T-shirt’s design and comfort – thanks to the persons in-charge from CSSC and LRDC, salute! * Second is that this would be my chance of a lifetime. I want a podium finish, which I had never experienced except when I was a dasher back in my grade school days. Knowing that there would be no “elite” runners around, I would seize the moment! * And a memory of a great race is something I want to keep of my career journey at Lexmark. 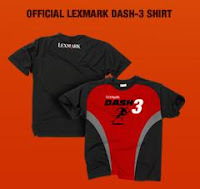 At LIPI, we received the announcement of this year’s Lexmark Dash 3 less than three weeks from the schedule of the event. With the aim of getting into the top 10 (no more, no less), I felt I did not have much time to train. But no matter what, I would not let this slip from my hand. 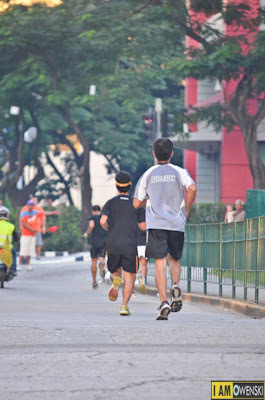 So the best thing I can do is to trust my simple training routine, which is composed of at least 5k jog/run twice a week, and a Sunday long run of at least 20Km. And to trust, that I CAN DO THIS! If I want to get the place of an elite runner, then I got to act one. So I confidently positioned myself at the front of the pack at the starting line. I had not much idea who are the other runners aiming what I aimed for — top 10, the podium finish. So I could not execute a plan on how to beat them. So, instead, I put focus on my race strategy. I had to remind myself to only worry about myself, my strategy, and my goal. I should not mind the others so I can avoid being carried away and suffer the consequence of getting burned-out during the race. My race plan was to take the lead from the start. To execute this, I plan to speed out at the first 200m, then maintain my 5KM pace after. Bang went off the gun start. I accelerated right away, and see myself leading the race approximately 300m from the starting line. But I could not feel victorious yet as I saw one runner overtaking me with a pace faster than mine, which distracted me for awhile from my race plan. I wanted to accelerate again so I could overtake him. But I reminded myself to control — to not give out, and maintain my race plan but I kept an eye on him. As if chasing one runner ahead of me was not thrilling enough, I also had to battle getting thirsty which I had to put aside as I need to maintain my position. Finally, controlling myself from speeding up paid off. The runner ahead of me finally showed that he could no longer maintain his pace. Around 2KM into the race, I overtook him, took a sip of water and was now ready again to lead. But I could not rest yet even though I was back in the leading position. I was already running above my normal planned pace knowing there were 2 or 3 runners closer to me. Approximately into the 3Km post, there were three of us alternately taking the lead. Until, I decided to let them take the lead while I stay behind them. This time, I took control of the show by teasing them to push harder, while I got a breather at the back of them — conserve and gain a few energy for a final push. Then, 500 meters to the finish line – This is it! Seeing that no one among the leads were dropping off from their position, I implemented my “final push” plan. I sped up, overtook them one by one until I finally got back the lead position until the finish line. I totally was not expecting getting the first place, of being the male category champion. Looking back, it was not getting the first place that made me feel victorious. But the thought that I gave out all my best and all that I had on that race was a “this-is-my-moment” moment. Congrats to everyone! We gave the Lexmark Dash 3 and ourselves a very good race. More than any thing else, I try to do my best in every thing I do, big or small, because I want to set an example to my kids. 21:39:51 is my clocked-in time. My new personal best time, and time to beat. I know that this time wouldn’t enough to compete Cebu’s elite runner in 5Km as I need at least sub-20 minutes. But this moment exceeded my expectation. 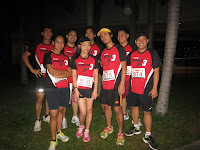 To get more runner’s story updates, please like our facebook.com/runroo page, or connect with us at twitter.com/gorunroo. 2 Responses to LEXMARK, Thank you for my “This is my moment” in running! Its nice to be a buddy of a champion…congrats bai torvs. !